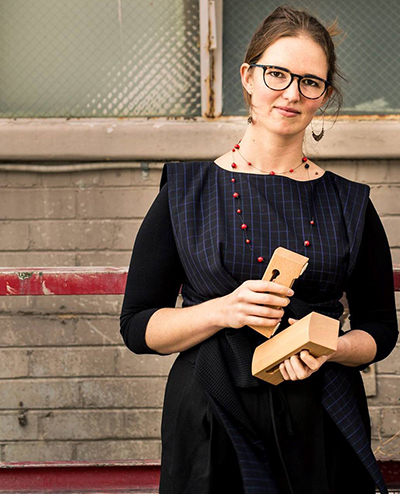 Dripping ice cores, fish song and a musical saw are just some of the unusual materials that will be used by percussionist, creator, educator and UWA grad Thea Rossen (BMusHons 2013) to create sounds fitting the theme of her latest project, Music for our Changing Climate. Thea will showcase her unique talents at a special celebration at the Lawrence Wilson Art Gallery on 17 November. The event will also feature an all-star panel discussion on plastic pollution (and what we can do about it), as well as the prizegiving ceremony for the three winners of this year’s Biology as Art Exhibition and Awards. Thea developed Music for our Changing Climate at the Banff Centre for Creativity and the Arts in Canada, to express through music and live performance ideas surrounding climate change. The project is a concert-length immersive experience that incorporates her selection of strange musical materials with curated and newly commissioned works for chamber ensemble. “Through this work I hope to be able to convey messages of global importance such as issues surrounding climate change,” Thea explains. Thea Rossen. She makes the sounds that make the whole world sing. Thea will be joined by Jesse Deane, a fellow staff alumnus and her collaborator at the Ad Lib Collective ensemble. “I’m proud of my Perth roots and grateful to UWA,” says the talented artist, who began studying a music and engineering double degree but instead “fell in love with music”. “I majored in percussion performance and had the opportunity to study with Perth’s best percussionists including Tim White and Dr Louise Devenish,” she explains. “The staff and lecturers at UWA were inspiring and deeply committed to their work, I am lucky to still be in touch with many of them. The musical creator says it was an opportunity to attend the Australian Percussion Gathering in 2009 that made her decide to pursue a career in music. “It helped to connect me to other players around Australia and form networks that I still use today,” she says. “During my studies I was heavily involved with the Music Students Society and was lucky enough to be the President in 2013. “We began a new concert series for composers to have their works premiered by students, organised the annual ball for Music Students, and facilitated engagements between other faculties on campus. As an educator Thea has designed and facilitated music workshops in regional, remote and metropolitan Australia for Musica Viva in Schools, Melbourne Symphony Orchestra, Melbourne Recital Centre and Art Play. She is also the director of percussion at Carey Baptist Grammar in Kew. During her time at the Australian National Academy of Music, Thea was awarded prizes for all of her solo recitals including Most Outstanding Performance and Best Program. The prizegiving ceremony for the three winners of this year’s Biology as Art Exhibition and Awards will also take place on 17 November.